Save with Our Daily Specials! When you are ready for a good time, come on over to The Hideout. 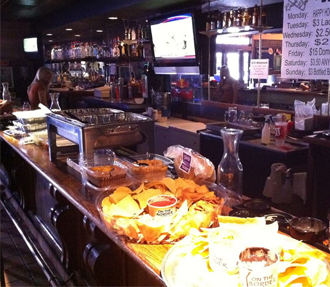 Our sports bar is the place to kick back with old friends and make new ones. As soon as you walk through the door, our friendly staff makes you feel welcome. We'll take your drink order right away and serve it to you in no time at all. While you're here, you have to try your luck at pool or our other games; or you can sit back and watch your favorite team play on one of our big-screen TVs. Whatever you do, we want you to have a great time. Stop in soon for a night of drinks and fun with your friends! Call (817) 577-3041 for more information. Hours of Operation: Monday - Sunday, 12:00 p.m.-2:00 a.m.
Karaoke from 9:00 p.m. - 1 a.m.
We Host an APA Pool League at 7:00 p.m.
Open Mic for Musicians from 10:00 p.m. - 2:00 a.m.
DJ Entertainment from 10:00 p.m. - 2:00 p.m.
Karaoke from 10:00 p.m. - 2:00 a.m.
Join us October 7th for Motorbreath(Metallica tribute band) from 8pm to 11 pm. $3 u call its from 8 pm to 10 pm. $3 u call its from 8 pm to 11 pm. If The Hideout of North Richland Hills, Texas, seems familiar to you, it's because it was formerly Rackdaddy's. We bought the place a few years ago, and we want you to know it's still a nice place for sports fans to have a few drinks and socialize in the Mid-Cities. The management and staff at our sports bar have over 100 years of combined hospitality experience. We know how to make sure you and your friends have a great time. All of our drinks are reasonably priced and we also provide great drink specials, including beer and cocktails. We invite you to join us any night of the week; and when there's a long holiday weekend, start it with us. Are you looking for a nice venue for a special event? We book office parties, birthday parties, and any other kind. Monday - Sunday, 12:00 p.m.-2:00 a.m.